I. 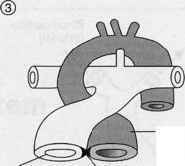 DEVELOPMENT OF THE PRIMITIVE HEART TUBE. A pair of endocardial heart tubes (mesodermal in origin) form within the cardiogenic region. A. 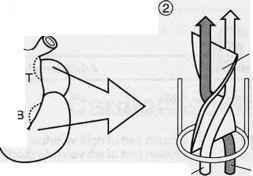 As lateral folding occurs, the endocardial heart tubes fuse to form the primitive heart tube, which develops into the endocardium. B. Mesoderm surrounding the primitive heart tube develops into the myocardium and epicardium. C- The primitive heart tube forms five dilatations: truncus arteriosus, bulbus cordis, primitive ventricle, primitive atrium, and sinus venosus. The fate of each dilatation is described in Figure 6-1. II. DEVELOPMENT OF HEART SEPTAE. 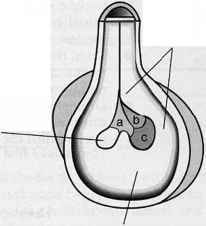 The primitive heart tube is a tube with a single lumen. This single lumen is partitioned into four definitive chambers by the formation of four septae: aorticopulmonary (AP), atrioventricular (AV), atrial, and interventricular (IV). Many congenital heart defects can be traced back to the abnormal formation of these septae. A. Aorticopulmonary (AP) septum (Figure 6-2). 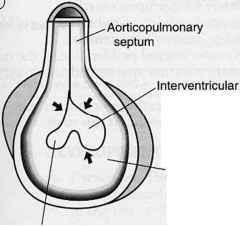 The AP septum divides the truncus arteriosus into the aorta and pulmonary trunk. 1. Formation. Neural crest cells migrate into the truncal and bulbar ridges, which grow in a spiral fashion and fuse to form the AP septum. 2. Clinical correlations a. Persistent truncus arteriosus is caused by abnormal neural crest cell migration such that there is only partial development of the AP septum. This results in a condition in which only one large vessel leaves the heart, and it receives blood from both the right and left ventricles. The resultant right-to-left shunting of blood leads to cyanosis. b. D-Transposition of the great vessels (complete) is caused by abnormal neural crest cell migration such that there is nonspiral development of the AP septum. This results in a condition in which the aorta arises abnormally from the right ventricle and the pulmonary trunk arises abnormally from the left ventricle. The resultant right-to-left shunting of blood leads to cyanosis. C. Tetralogy of Fallot is caused by abnormal neural crest cell migration such rhat there is skewed development of the AP septum. This results in a condition classically characterized by: pulmonary stenosis, overriding aorta, IV septal defect, and right ventricular hypertrophy. The resultant right-to-left shunting of blood leads to cyanosis. The smooth part of the left atrium is formed by incorporation of parts of the pulmonary veins into the atrial wall. The junction of the trabeculated and smooth parts of the right atrium is called the crista terminalis. Figure 6-1. The five embryonic dilatations of the primitive heart rube, and the adult structures derived from them. B. Atrioventricular (AV) septum (Figure 6-3). The AV septum divides the AV canal into the right AV canal and left AV canal. 1. Formation. The dorsal and ventral AV cushions fuse to form the AV septum. 2. Clinical correlations a. Univentricular heart is caused by an extremely skewed development of the AV septum to the right. This results in a condition in which one ventricle receives both the tricuspid and mitral valves. b. Tricuspid atresia is caused by an insufficient amount of AV cushion tissue available for the formation of the tricuspid valve. This results in a condition in which there is complete agenesis of the tricuspid valve so that no communication exists between the right atrium and right ventricle. 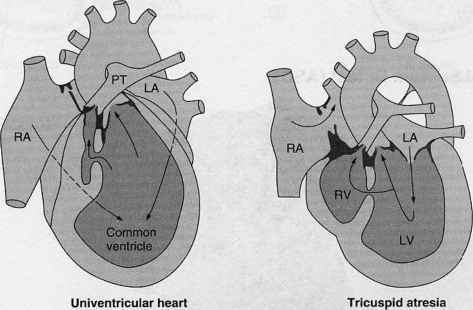 Tricuspid atresia is characterized by: a patent foramen ovale, IV septal defect) overdeveloped left ventricle, and underdeveloped right ventricle. C. Atrial septum (Figure 6-4). 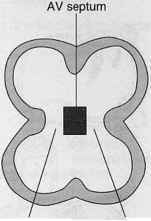 The atrial septum divides the primitive atrium into the right and left atria. 1. Formation a. The septum primum grows toward the AV septum. b. The foramen primum is located between the edge of septum primum and the AV septum; it is obliterated when the septum primum fuses with the AV septum. C. The foramen secundum forms in the center of the septum primum. d. The septum secundum forms to the right of the septum primum and fuses (after birth) with the septum primum to form the atrial septum. Figure 6-2. (A) Formation of the aorticopulmonary (AP) septum. 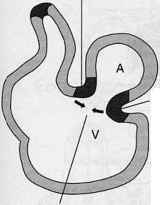 ©Partitioning of the truncus arteriosus and bulbus cordis, involving neural crest cell migration. ®The AP septum develops in a spiral fashion.©The spiral AP septum accounts for the adult gross anatomic relationship between the aorta (shaded) and the pulmonary trunk (unshaded). (B) AP septal defects: persistent truncus arteriosus, D-transpositicn of the great vessels (complete), and tetralogy of Fallot. Figure 6-3. 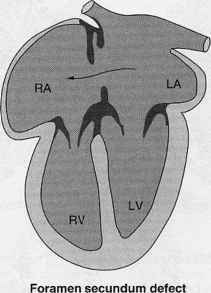 (A) Formation of the atrioventricular (AV) septum: The partitioning of the AV canal. (B) AV septal defects: univentricular heart and tricuspid atresia. 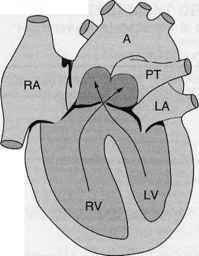 A = atrium; AV = atrioventricular; V = ventricle; RA = right atrium; RV = right ventricle; LA = left atrium; LV = left ventricle. occur soon after birth and is facilitated by the increased left atrial pressure that results from changes in pulmonary circulation. 2. Clinical correlations. Heart defects involving the atrial septum are called atrial septal defects (ASDs). a. Foramen secundum defect is caused by excessive resorption of the septum pri-mum, septum secundum, or both. This results in an opening berween the right and left atria (patent foramen ovale). If the ASD is small, clinical symptoms may be delayed as late as age 30. This is the most common clinically significant ASD. Figure 6-4. (A) Formation of the atrial septum. The arrows in ©indicate the direction of blood flow across the fully developed septum, from the right atrium to the left atrium. (B) An atrial septal defect: foramen secundum defect. The anoiv indicates the abnormal flow of blood through the defect. b. Premature closure of foramen ovale is the closure of the foramen ovale during prenatal life. This results in hypertrophy of the right side of the heart and underdevelopment of the left side. D. Interventricular (IV) septum (Figure 6-5). 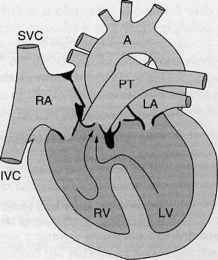 The IV septum divides the primitive ventricle into the right and left ventricles. Figure 6-5. 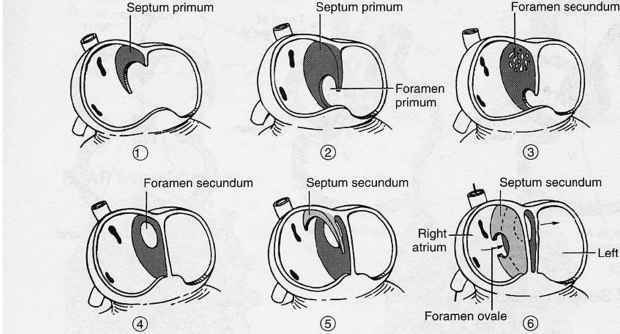 (A) Formation of the interventricular (IV) septum: partitioning of the primitive ventricle. Shaded portions (a, b, c) in (2) indicate the three components of the membranous IV septum, a ~~ right bulbar ridge; b = left bulbar ridge; c = AV cushions. (B) an IV septal defect: Membranous VSD. Arrows indicate the direction of blood flow. 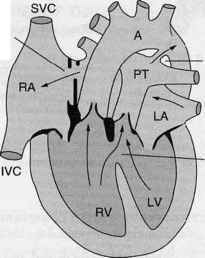 A = aorta; IVC = inferior vena cava; LA = left atrium; LV = left ventricle; PT = pulmonary trunk; RA = right atrium; RV = right ventricle; SVC = superior vena cava. 1. Formation a. 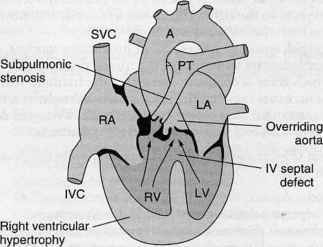 The muscular IV septum develops in the floor of the ventricle; it grows toward the AV cushions but stops short leaving the IV foramen. b. The membranous IV septum forms by the fusion of three components: the right bulbar ridge, left bulbar ridge, and AV cushions. This fusion closes the IV foramen. 2. Clinical correlation. A membranous ventricular septal defect (VSD) is caused by incomplete fusion of the right bulbar ridge, left bulbar ridge, and AV cushions. This results in a condition in which an opening between the right and left ventricles allows left-to-right shunting of blood through the IV foramen. Patients with left-to-right shunting complain of excessive fatigue upon exertion. a. Initially, a membranous VSD is associated with left-to-right shunting of blood, increased pulmonary blood flow, and pulmonary hypertension. b. Later, the pulmonary hypertension causes marked proliferation of the tunica intima and tunica media of pulmonary muscular arteries and arterioles, thus narrowing their lumen. C. Ultimately, pulmonary resistance becomes higher than systemic resistance and causes right-to-left shunting of blood and cyanosis. At this stage, the condition is called the Eisenmenger complex. 'Early in development, the recurrent laryngeal nerves hook around aortic arch 6. On the right side, the distal part of aortic arch 6 regresses, and the right recurrent laryngeal nerve moves up to hook around the right subclavian artery. On the left side, aortic arch 6 persists as the ductus arteriosus (or ligamentum arteriosus in the adult); the left recurrent laryngeal nerve remains hooked around the ductus arteriosus. 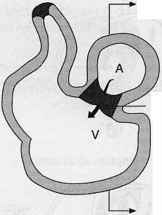 IVC = inferior vena cava; SVC = superior vena cava. A. Formation. The arterial system develops from the aortic arches (contributes to arteries in the head and neck region) and the dorsal aorta (which contributes to arteries in the rest of the body). The dorsal aorta sprouts posterolateral, lateral, and ventral branches (i.e., vitelline and umbilical arteries). 1. Postductal coarctation of the aorta occurs when the aorta is abnormally constricted just distal to the ductus arteriosus and left subclavian artery. a. 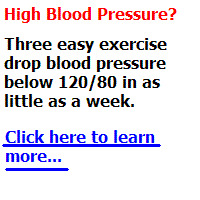 This condition is clinically associated with increased blood pressure in the upper extremities, lack of a femoral pulse, and a high risk of both cerebral hemorrhage and bacterial endocarditis. b. Collateral circulation around the constriction involves the internal thoracic, intercostal, superior epigastric, inferior epigastric, and external iliac arteries. Dilatation of the intercostal arteries causes erosion of the lower border of the ribs (called "rib notching"), which can be seen on a radiograph. 2. Patent ductus arteriosus (PDA) occurs when the ductus arteriosus, a connection between the left pulmonary artery and the arch of the aorta, fails to close. Normally, the ductus arteriosus closes within a few hours after birth via smooth muscle contraction to form the ligamentum arteriosum. a. PDA causes a left-to-right shunting of blood from the aorta back into the pulmonary circulation. b. PDA is very common in premature infants and in infants born to mothers who contracted the rubella virus during the course of their pregnancy. C. Prostaglandin E, intrauterine asphyxia, and neonatal asphyxia sustain the patency of the ductus arteriosus, d. Prostaglandin inhibitors (e.g., indomethacin), acetylcholine, histamine, and catecholamines promote closure of the ductus arteriosus. IV. DEVELOPMENT OF THE VENOUS SYSTEM (Table 6 2). The venous system de velops from the vitelline, umbilical, and cardinal veins that empty into the sinus veno-sus. These veins undergo remodeling owing to a redirection of venous blood from the left side of the body to the right side in order to empty into the right atrium. 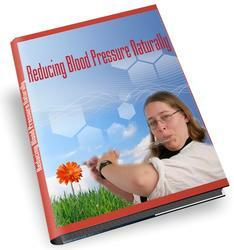 What are the clinical correlate of the circulatory system?